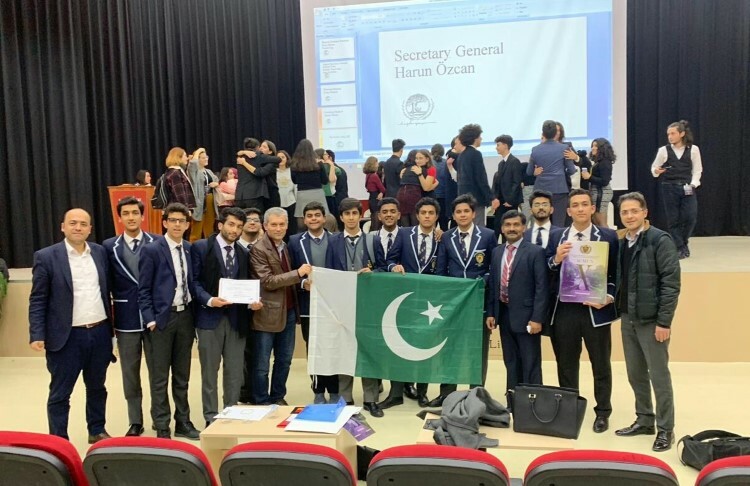 The Aitchison College Model United Nations Society had already proved itself to be the best in Pakistan; now it was time to go beyond the nation and the Haydarpasa Model United Nations in Istanbul Turkey presented the perfect opportunity. An eleven member team was sent under the supervision of the Dept. Headmaster, Dr. Muhammad Kamran. The Turkish adventure presented new challenges, but we stepped up to 'walk a mile in the shoes' of economists, Napoleon’s ministers and ambassadors in various committees such as the Economic and Social council, Napoleon’s cabinet and International Maritime Council. The Haydarpasa Model United Nations was the first international conference for the boys. Wasay Mir, Abbas Fateh ud Din, Sadiq Soofi, Reza Khan and Senan Khawaja managed to bag the best delegate awards, while Rafay Shamsi, Sheharyar Tariq and Bilal Azam won outstanding diplomacy awards and Shahmeer Nawaz and Ahad Ahmed Bajwa received honourable mentions. The boys also managed to bring home the Best Delegation Award. In doing so, one of our Turkish host’s described our victory as being achieved in“the IVY league of MUNers”. Of equal importance, the Conference gave us an opportunity to showcase our talents on an international scale, while providing a once in a lifetime opportunity to learn and understand different perspectives. The boys proved their mettle and made the College proud, yet again.